Bunge Romania contributes to the improvement of people’s lives through the continuous development of its products by controlling the entire production chain through its operations, from the purchase of oilseeds to the products of its consumers’ meals. 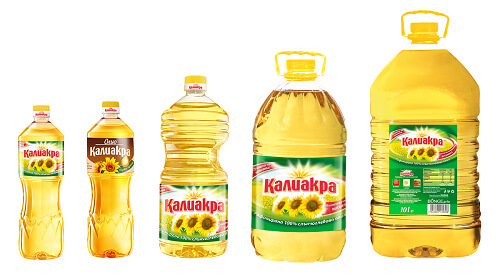 Bunge Romania produces and sells vegetable edible oil, bulk, and bottles, to meet the demands of end-users, as well as the requirements of processors in the food and non-food industry. With a permanent focus on nutrition and health, Bunge Romania develops new products rich in micronutrients or improved fatty acid profiles for the benefit of consumers. Product quality and innovation are our permanent concerns. Bunge’s portfolio includes 9 brands, and the most important on the Romanian market are Floriol, Unisol, Raza Soarelui and Ulvex and Kaliakra in Bulgaria. The largest range of premium oils in Romania that differentiates itself through the benefits offered to modern, active consumers, looking for solutions and healthy choices. 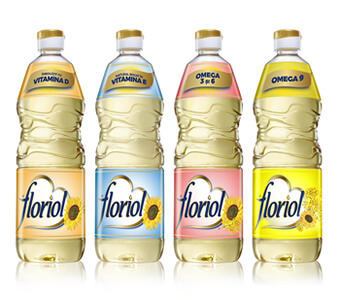 Floriol sustains a healthy lifestyle that begins with a varied and balanced diet. The balance does not just come from moderation, but also from the way you combine ingredients to give your body the variety of nutrients, including different fatty acids. Floriol range assortments will help you prepare all your favorite meals: from fresh Mediterranean recipes and salads to soups, tarts, steaks or even cakes. 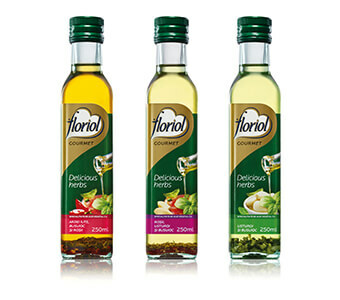 We invite you to try the Floriol Gourmet Delicious Herbs, to discover the perfect balance of superior sunflower oil and the delicious taste of garden herbs. Unleash your creativity in the kitchen! 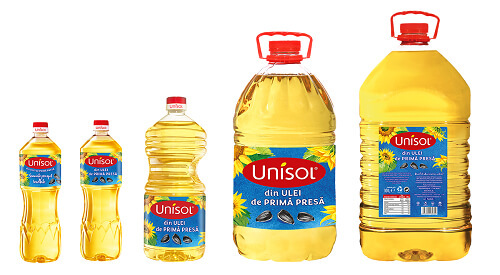 Unisol from the first press is the first Romanian oil obtained 100% of the first crush of sunflower seeds, without interfering with extra processes and refined for taste and balanced smell. Unisol from the first press sustains home cooked food with natural ingredients. Pack sizes: 1l, 2l, 5l, 10l and autumn limited edition, Unisol freshly harvested seeds 1l. Bunge Romania launched Unisol freshly harvested seeds, obtained from the first pressing of the annual crop sunflower seeds, in order to preserve the essence and the flavour of the seed’s core. Raza Soarelui is a 100% refined sunflower oil that perfectly fits the needs of those who want to do a lot with very small quantity. 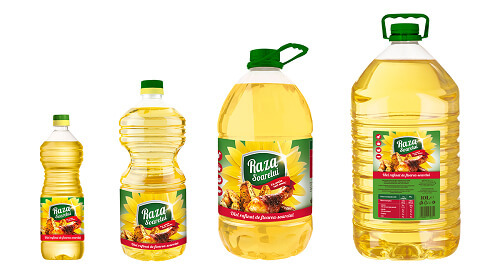 Raza Soarelui is an oil that will always be remarked by the affordable price, being available on the market in 4 pack sizes: 1l, 2l, 5l and 10l. Kaliakra, the soul of the food! Kaliakra oil captures the goodness of nature and sunflower seeds altogether. Kaliakra oil is the essential ingredient that makes food delicious and appreciated by the whole family. Kaliakra is 100% refined sunflower seed oil, designed for women who appreciate traditional values and who perceive cooking as an important part of family care. Available in 4 pack sizes: 1l, 2l, 5l and 10l. Ulvex, best choice, best cooking! 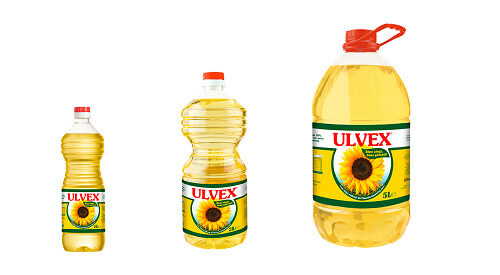 Ulvex oil is a 100% refined sunflower oil, which can be a perfect choice for pastries and HoReCa industry. For those who want maximum productivity at low cost , Ulvex is available on the market in 3 pack sizes: 1l, 2l and 10l.